Who doesn't love the smell of fresh popcorn! 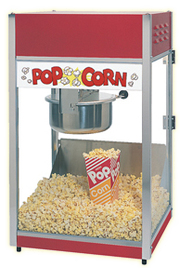 Grab a pop corn machine rental for your next party or event. We several options available. Call today or click below for a quote! Supplies: Supplies include- seed, oil, flavoring, bags. Surface: Can be used for indoor or outdoor events. A Table to required for the tabletop model. Rental Cost Includes 100 Servings, additional servings are $20 per 50. Supplies: Supplies include- seed, oil, flavoring, bags and are sold in increments of 100. 100 servings included in rental cost, additional servings $20.00 per 50. Have a popcorn machine in need of repairs or a thorough cleaning? Call us today and ask about our popcorn mACHINE SERVICES. wE OFFER REPAIR AND CLEANING SERVICES AT AN AFFORDABLE PRICE.